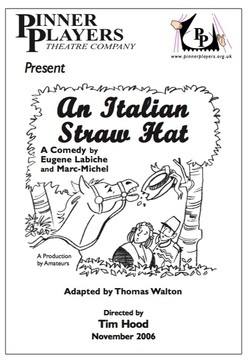 "The play was the forerunner of the classic French farce. Its descendants are the Whitehall farces of Ben Travers, the slapstick silent films of the Keystone Cops and the enormous output of Alan Ayckbourn. The characters are instantly recognisable: the ‘hero’ caught up in a whirlwind he cannot control; the pompous father-in-law; the deaf old man who misinterprets everything (very un-PC! ); the flighty wife; the cuckolded husband... these have been the stock of comedy-drama since Roman times, but Labiche made them all very human. There are “running gags” throughout the play: the pot of myrtle, the painful shoes, the reference to cousins; and stitching the action together is the bewildered Wedding Party – “eight cabs full” – who follow the bridegroom round Paris, creating mayhem, and eventually get arrested by the police."